After casting their collective mind back to the 2010 tournament in South Africa and recalling just how fondly people took to the vuvuzela’s incessant moronic honk, World Cup 2014 hosts Brazil have come up with their very own infernal instrument with which they hope to drive football fans around the world totally and utterly insane. It’s called a caxirola and it’s a little plastic handheld capsule full of pellets that is shaken by the virtuoso playing it to create a percussive rattle. How great is that going to sound once it’s multiplied by 60,000? 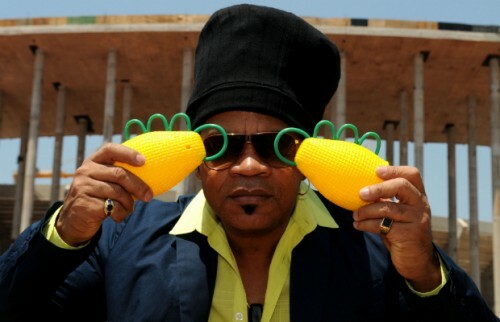 The caxirola has been designed in a collaboration between Brazilian musician Carlinhos Brown (that’s him up there) and the country’s ministry of sports, who have specifically honed the sound to be “less grating” than the maddening din created by the vuvuzela. Great. Now every single game at the 2014 World Cup is going to sound like a shopping trolley falling down a flight of concrete steps. Still sounds ten times better than those horrible, horrible drones that the vuvuzelas made. Oh god, bad memories coming back. NOOOOOOOOOOOOOOOOOOOOOOOOOOOOOOOOOOOOOOOOOOOOOOOOOOOOOOOOOOOO!!!!!!!!!! I think you’re being too harsh on the Brazilians here Chris. Brazil has an amazing history of percussion music, it’s one of the only countries that have such an innate talent and rhythm that I think this is actually going to sound pretty magical when 60,000 people are doing it together. Plus they can sing over it, which, I think anyone will admit, is going to be preferable to the perennial HAAAAAARRRRRGGHHH of the vuvuzela. no mate, we’d be using the recorders that we use to have to learn to play when we were in primary school. Imagine that sound eh? Sooooooooo, they’re maracas that you can bang together. Cool.